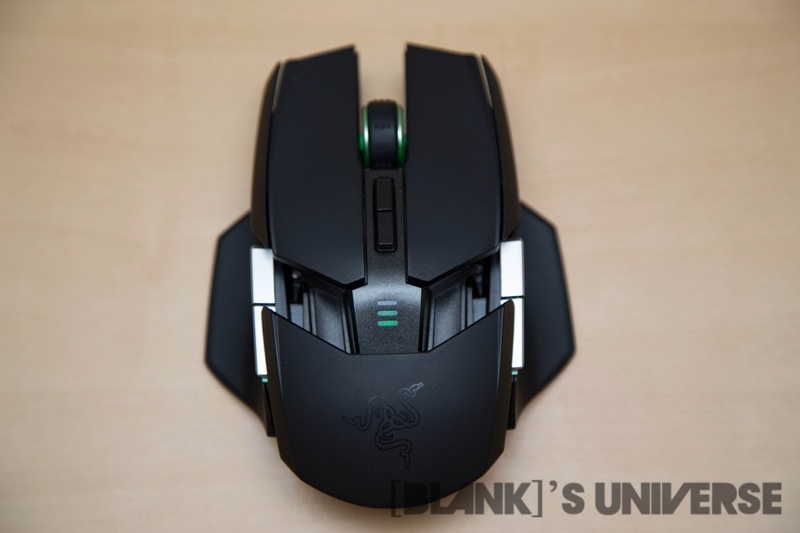 Razer, manufacturer of well known gaming peripherals, has released a new king to their line up, the Razer Ouroboros. 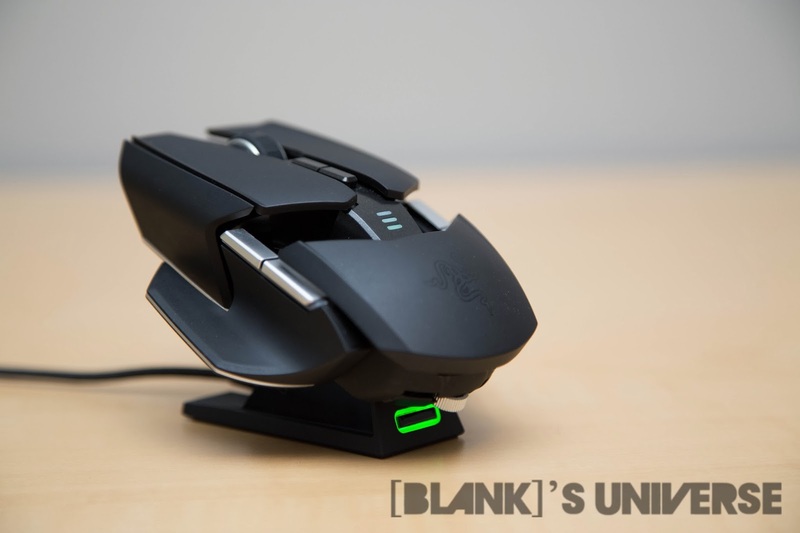 The Ouroboros sits on the top of Razer’s line up as the flagship wireless gaming mouse, to replace the previous flagship, the Razer Mamba. The Ouroboros features a modular and fully adjustable design, similar to what is found on the R.A.T.9 by MadCatz. It allows users to swap out the side panels depending on how they hold the mouse along with being able to adjust the length and angle of the palm rest. Additionally, Razer has implemented features that gamers have been complaining about for a while, like non-proprietary batteries, and the ability to work in both wired and wireless modes. 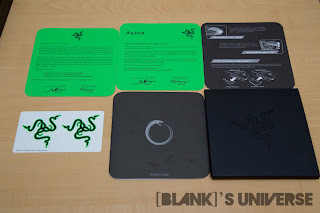 Taking a look at the packaging, there is no exception to Razer’s astounding packaging with the Ouroboros. It comes in a fatter but shorter box than what the Mamba came in. Awards are plastered along the front of the box and the clear top shows off the mouse, which is sitting upon a pedestal. Once we open up the box, we are greeted by the mouse first, opposed to the heaps of paperwork we normally see with products. Taking the mouse off of it’s pedestal is similar to taking an iPod touch out of it’s box, bend the plastic tab at the bottom hoping you don’t break anything, and slide the mouse out. Underneath the pedestal we find the charging/wireless dock. Under all the clear plastic with the mouse and dock, we find the standard documentation as well as accessories for the mouse. As far as documentation goes, you get the standard things with any of Razer’s other products, as well as the very important Razer stickers. 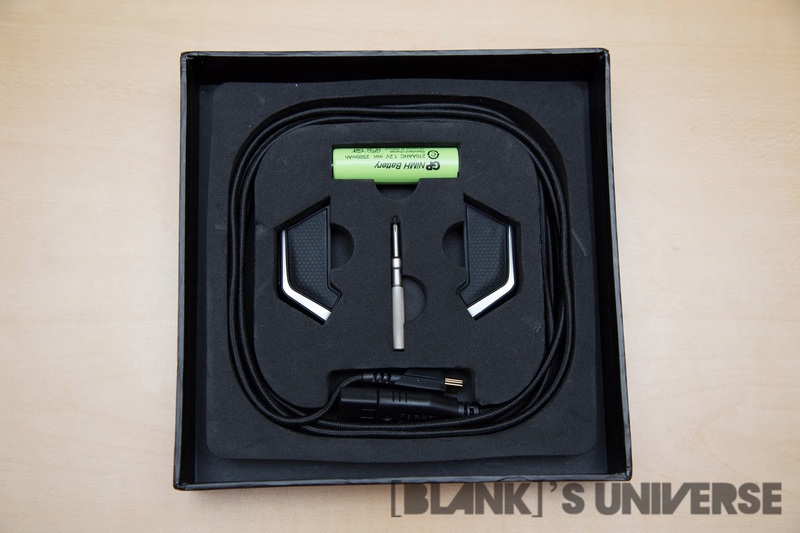 For accessories, included is a high quality braided USB to mini USB cable, with gold plated connectors, an extra set of modular side panels without the plastic wings on the end, a 2500mAh 1.2 NiMH battery from GP, and a small screwdriver we couldn't find a use for. 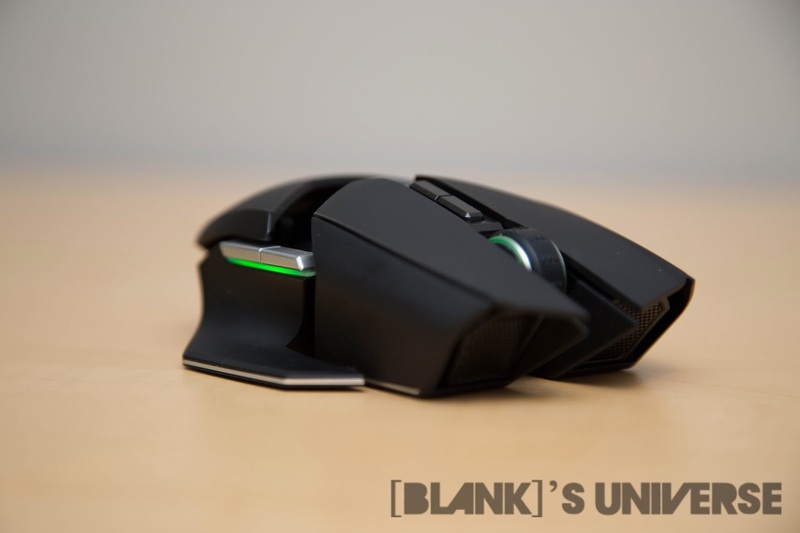 The Razer Ouroboros is an ambidextrous mouse, similar to the Taipan, and also shares a similar design. 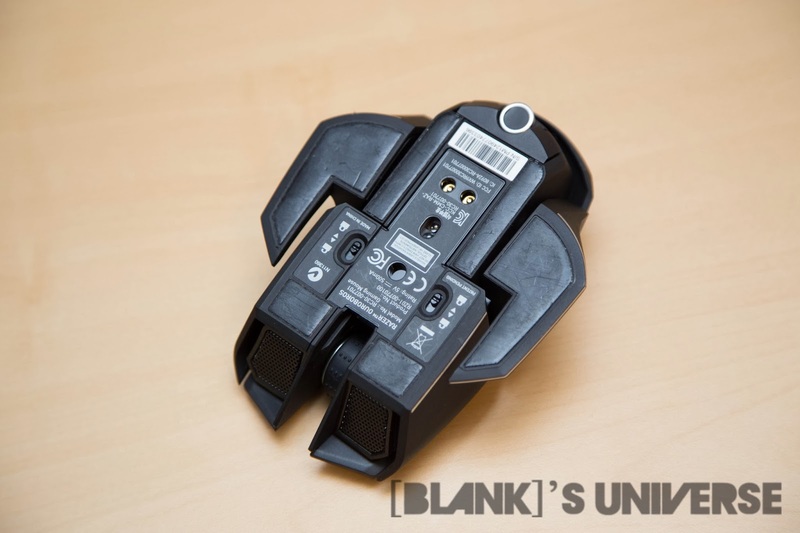 The mouse has three buttons on both sides sides, one is found on the side panel and can be disabled, as well as DPI adjustment buttons under the scroll wheel, and the very important left and right click buttons. There is also a battery life indicator located under the DPI adjustment buttons. 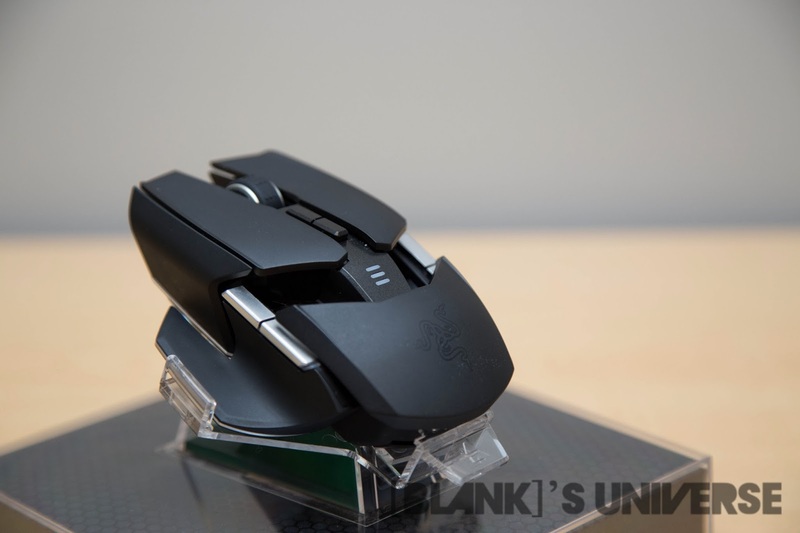 The entire mouse is plastic and has a soft rubbery coating on it which seems durable and wont start peeling off. 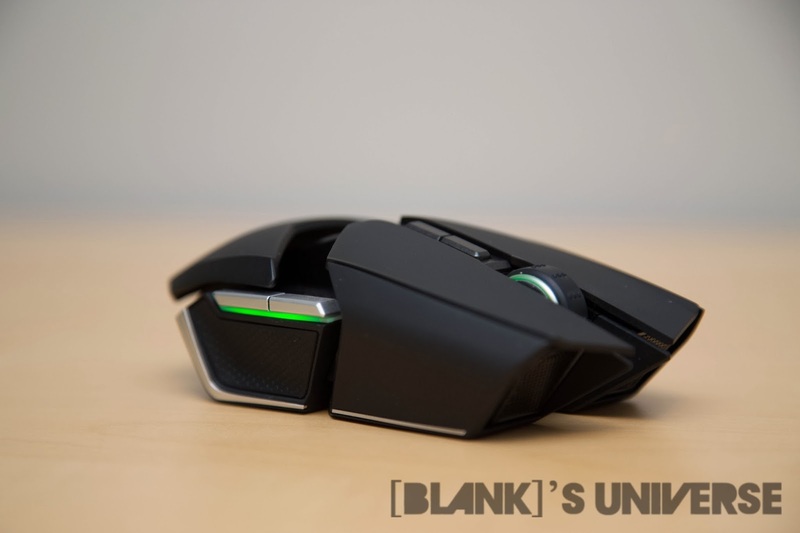 The Razer Ouroboros is an extremely modular mouse, so of course it includes a barrage of adjustment do-dads. 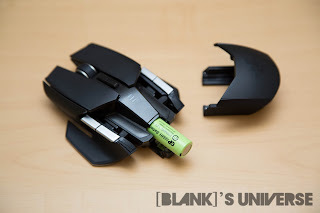 The sides of a mouse are interchangeable, between ones with plastic wings on the side for your thumb and pinky, or a more grippy ones for users who prefer a claw grip. If you really wanted, you could use a combination of the two. 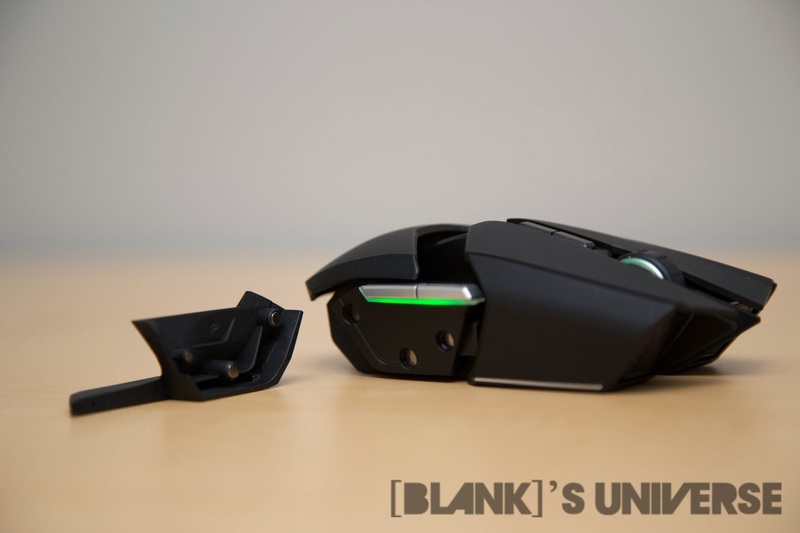 The side panels act as a programmable button, default setting is a DPI clutch at 800DPI, but can be disabled with a switch found under the mouse if you tend to press it while picking up the mouse. On the bottom, we notice that it is essentially Teflon feet with a hole for the sensors and adjustment knobs. 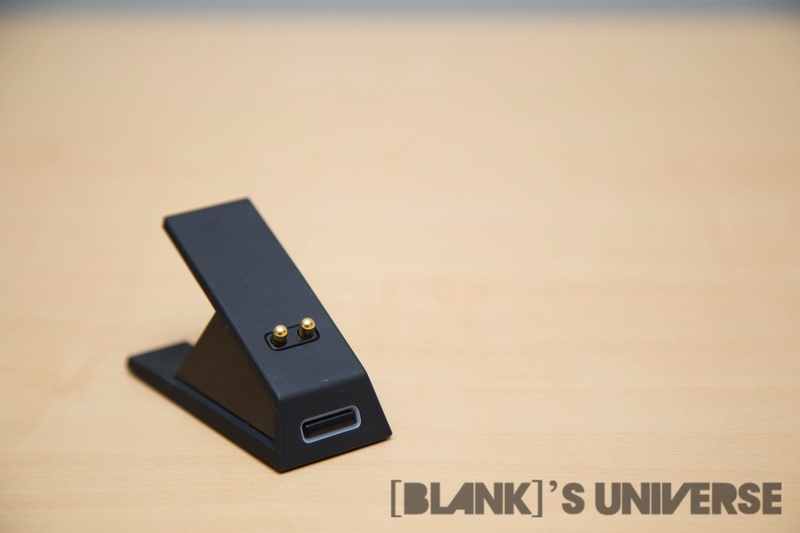 In the center lies two sensors, as well as two brass contacts for charging on the dock. There are also two switches for disabling the side panel buttons, a knob on the very end to adjust the angle of the palm rest, as well as a button to adjust the length. 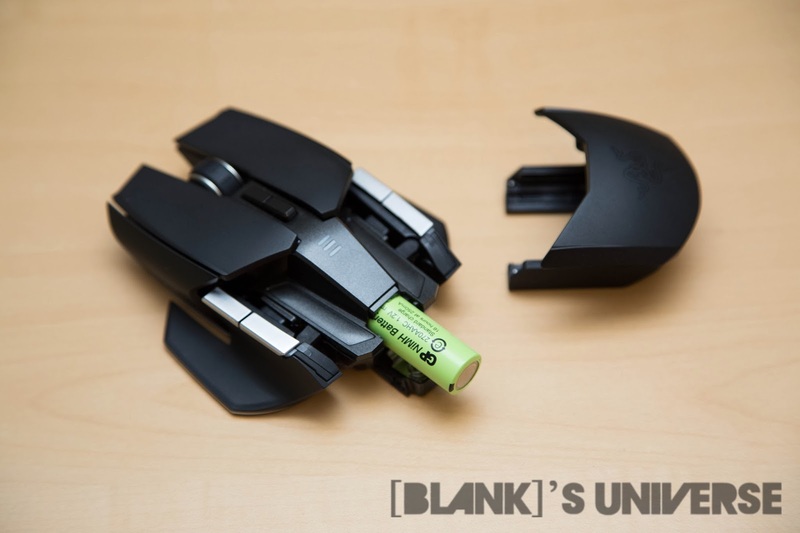 Pulling off the palm rest completely will provide access to the battery compartment which accepts the provided battery or any standard AA size battery. Make sure that you don’t try to charge the mouse with standard alkaline batteries in the mouse. The battery claims to provide a 12 hour continuous run time, but I found that it fell to 75% charge after a short while. The charge indicator on the mouse also does not show the percentage as you would expect it to. Since there are 3 bars, you would assume that 3 bars would be 100%, 2 bars would be 66% and 1 bar would be 33%, but that is wrong. All three means that the battery is full, 2 bars mean there is a 75% charge and 1 bar means there is a 25% charge. Unfortunately, there is no ability to keep an extra charged battery in the dock like the R.A.T.9, so charge times can be lengthy if the battery happens to die while you’re using it. You can pull the cable out of the dock and plug it into the mouse to start charging it while you’re using it, but that defeats the whole purpose of a wireless mouse. 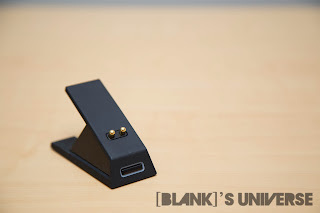 The wireless dock for the mouse has a matte finish on the top and glossy finish on the sides. It feels extremely well built and solid as well. 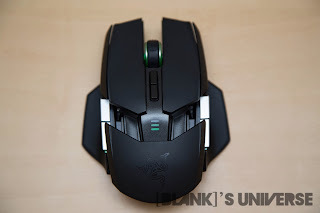 I found that it was quite difficult to get the mouse to align with the contacts on the bottom of the mouse, and often took multiple attempts. 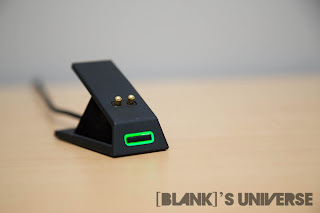 There are extreme sticky pads on the bottom of the dock which allows the cable to be plugged and unplugged without touching the dock, and you can even stick the dock on a vertical surface, don’t know why you would though. Like all of Razer’s new peripherals, it uses Synapse 2.0 so setup is easy, as long as you have an Razer ID. 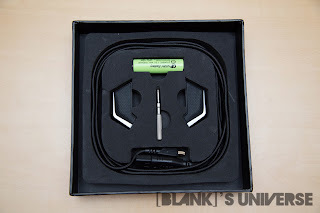 If you don’t have Synapse installed, download the latest one from the Razer website and it will guide you through the installation process, as well as deal with all the drivers for any Razer device you may have plugged into your computer. Taking a look at the available menus, which is a lot, there are separate tabs for each category of settings. The default tab is the customize tab which allows you to set a function for any button on the mouse, except the left click, or disable buttons you don’t want to use. In the performance tab, you can set the mouse sensitivity from 100DPI to 8200DPI as well a mouse acceleration and polling rate (Max up to 1000Hz). The lighting tab allows you to change the lighting brightness for when the mouse is plugged in and when it is in wireless mode. There are 4 settings from: off, dim, normal, and bright. There is a calibration tab which allows you to calibrate the mouse to any mouse pad, with the Razer ones available as pre-sets. Here you can adjust the lift off range as well. Lastly, we find the power tab which allows you to see the battery life of the mouse, the time before the mouse goes to sleep, and when the battery indicator should flash to let you know you’re about to run out of power. The mouse performance was accurate most of the time but the y-axis would move significantly slower than the x-axis at times, even with surface calibration off. I did not notice any significant lag between the wireless mode and the wired mode, which is a common issue with wireless mice. The mouse fit very comfortably in my hand due to the many adjustment options, and my left handed friend appreciated the ambidextrous design. The sensor performance was decent from the Avago ADNS-9800, but was not as accurate as the sensor found in the DeathAdder. I had some problems with the mouse not connecting to the dock, or not tracking while all the buttons were working. When taking it out of wired mode and putting it into wireless, I found that only the DPI buttons would work while nothing else would, and the fix would be to plug it into a different USB port and let windows reinstall the drivers for it. Eventually I ran into an Issue with the dock being stuck in Razer Bootloader mode and would no longer function. Razer was happy to resolve the the problem and was very quick to ship out a new dock. Overall, the mouse was not as nice as I had expected, and for $149.99 I expected a lot since this is the most expensive mouse (at the time of writing) available. It was also disappointing that the sensor from the far cheaper and older DeathAdder is more accurate than the one found in the Ouroboros. 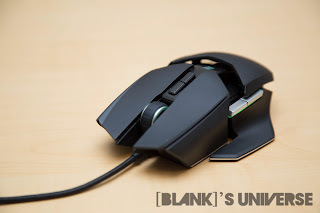 The plastic construction of the mouse didn’t feel like it matched the $149.99 price tag on the mouse, as my $60 Corsair M60 had aluminium construction and felt better built. If you have extra cash to spend and love the design of the Ouroboros, than this is the mouse for you. If not, i’d rather buy a different mouse for less and live with having a wired mouse. 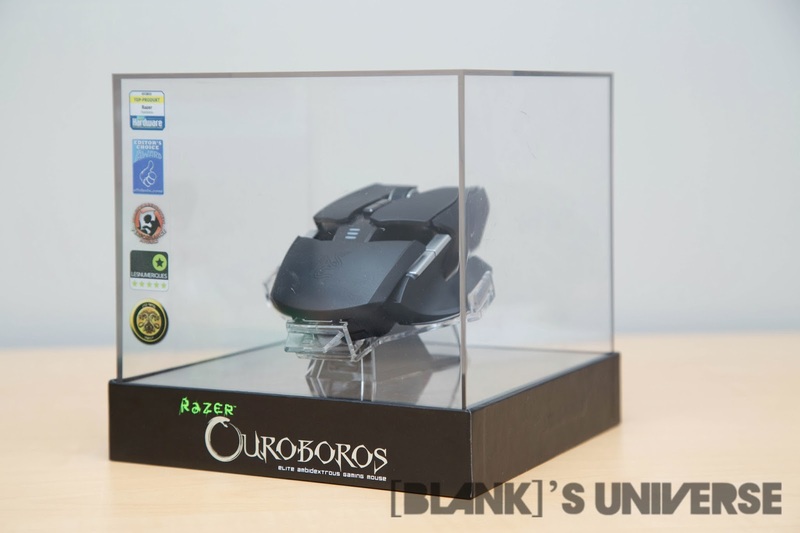 You can pick up an Ouroboros youself on the Razer Store.